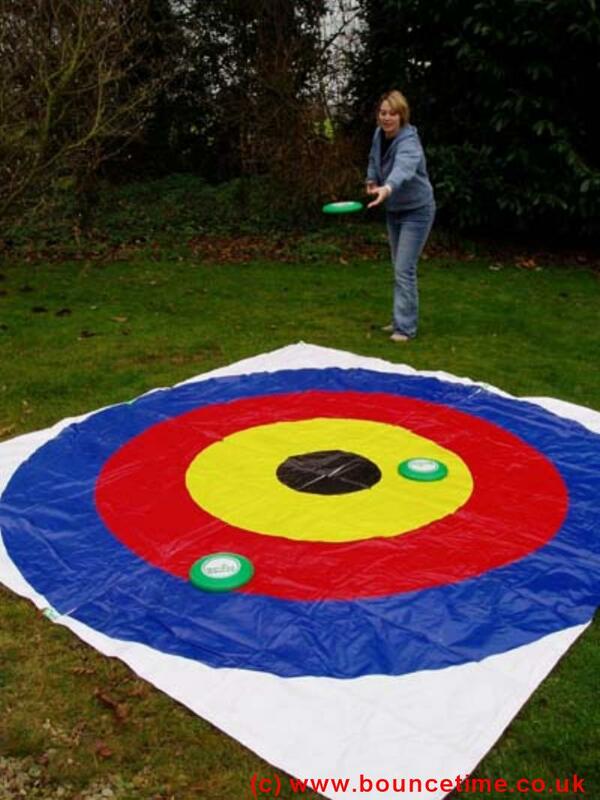 On Target Frisbee Giant Garden Game - Bouncy Castle Hire 4 Kettering, Corby, Wellingborough, Rushden, Raunds, Rothwell, Desborough, Market Harborough, Adult Castle, Slide, sumo wrestling, Sumo, Crazy Games, Giant Garden Games, Northamptonshire. Our inflatables are ideal for kids parties, adult parties, Garden Party and a corporate or business event. Large and small events are catered for and we are fully insured. We offer cheap and discount prices in school holidays and for larger events. On Target uses 3 traditional 'Frisbee' Style flying discs and adds skill and competition with a giant target to aim for. Players take turns to throw 3 flying discs from a distance, aiming to land them on the large 3 meter diameter target mat. © Copyright 2006 Bounce Time. All Rights Reserved.